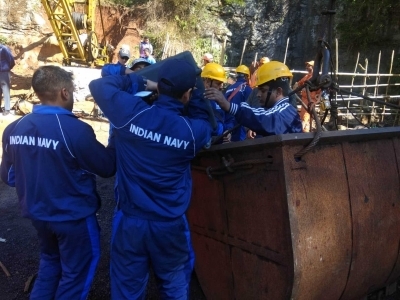 Shillong, Feb 12 (IANS) Three days after suspending operations for equipment maintenance, an Indian Navy team on Tuesday resumed their search for 14 miners trapped inside an illegal, 370-feet flooded coal mine in Meghalaya's East Jaintia Hills district, an official said. Out of the 15 miners trapped in the 'rat-hole' mine in December last year, the Navy had found and retrieved the body of one on January 23. Another body was detected on January 26 but it is yet to be retrieved due to high turbidity of the water there. On Saturday, the 15-member navy team from Visakhapatnam had suspended their operation for periodic maintenance of their machines and underwater remotely-operated vehicles. "The Indian Navy resumed their search and rescue operation with the ROVs in the main shaft and the search is going on in the rat-hole where the 14 miners are believed to have been trapped," rescue operation spokesperson Reginald Susngi said. He said the Navy has repaired their machines which developed some technical snags and brought them back to the site for use. Meanwhile, Coal India Ltd and Kirloskar Brothers Ltd teams are continuing to pump out water from the abandoned coal mine shafts. The accident inside the coal pit at Ksan village on December 13 came even after the National Green Tribunal (NGT) had ordered an interim ban on rat-hole coal mining in the state from April 17, 2014. The tragedy came to light after five miners escaped the coal pit which became flooded with water from a nearby river. The apex court, which is monitoring the rescue operations, has directed the government that the trapped miners have to be taken out of the coal mine whether "dead or alive". Assam records 78.52% voting till 5 p.m.